You are here: Home / Health & Diet / How To Ease Stomach Rumbling? How To Ease Stomach Rumbling? Stomach rumbling or growling is caused by movements of fluids and gases in the stomach and small intestine. The embarrassing noise may be caused by factors like hunger, incomplete digestion, consumption of high fiber and high carbohydrate foods, and faster metabolism. In most cases, it happens when you swallow air while eating, drinking, or talking. 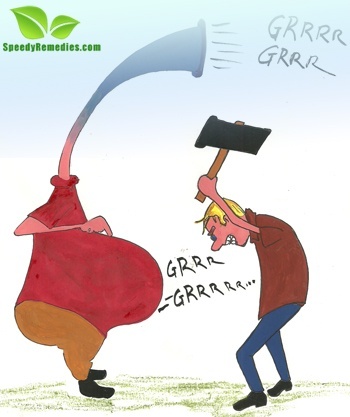 As the term itself indicates, stomach rumbling is characterized by a rumbling, grumbling, or gurgling noise from the abdomen that can be socially embarrassing. In medical terms, stomach rumbling is known as borborygmus (its plural is borborygmi). The condition may be accompanied by symptoms like bloating, belching, flatulence, abdominal discomfort, diarrhea, and stomach cramps because it is usually caused by a buildup of intestinal gas. At times, stomach rumbling may also be caused by problems such as Lactose Intolerance, Food Allergies, Functional Dyspepsia, Celiac Disease, Irritable Bowel Syndrome, Crohn’s Disease, Colitis, and Diverticulitis. Basically, the growling sound is produced when the ingested food is pushed downwards along the digestive path due to wave-like muscle contractions. As the solid matter and liquids move along with air and gasses, and are processed for absorption, pockets of air and gas may also get squeezed, thereby creating the occasional rumbling sounds. These sounds are more commonly associated with hunger because the growling tends to be louder when the stomach and intestines are empty; the noise is muffled when the stomach is full. The rumbling is likely to increase after the stomach has been empty for almost two hours. Besides, you may experience this embarrassing problem when taking antibiotics because these medicines change the flora of the intestine by killing the ‘bad’ as well as ‘good’ bacteria that aid in digestion. • Avoid over consumption of foods rich in fiber and carbohydrates. Milk, dairy products, beans, legumes, whole wheat, brown rice, seeds, cabbage, spinach, broccoli, asparagus, Brussels sprouts, carrots, cauliflower, radishes, parsnips, onions, peas, potatoes, artichokes, processed meats, popcorn, hot sauces, apples, apricots, raisins, and dried fruits are some of the most common foods that encourage the production of intestinal gas.You need not eliminate these items from your diet; just take them in moderation. Moreover, explore better options like having low-fat cheese, low-fat frozen yogurt, creamy peanut butter, mashed potatoes without skins, vegetable soups, and so on. Plus, eat fruits with low fiber content like grapes, berries, plums, kiwi, etc. • Avoid drinking beer, alcohol, coffee (caffeine acts as a stimulant), and carbonated beverages. Use of artificial sweeteners also tends to cause gas.Here’s a video explaining the causes of stomach growling. • Consuming a teaspoon of olive oil in the morning during breakfast can help reduce the noise as it prevents intestinal contractions.In addition, regularly taking aloe vera juice is useful for calming stomach growling, especially for individuals suffering from Irritable Bowel Syndrome with constipation. • Habits like smoking, chewing gum, sucking on hard candy, and sipping fluids with the help of a straw make you swallow more air. Thus, limit these behaviors. Similarly, do not drink water or any other liquid while eating. • Take a balanced diet with small, frequent meals. In fact, try to take your meals at a specific time. Moreover, you may drink a cup of herbal tea after a meal. • If you go without food for long and hear grumbling noises from your stomach, eat a small snack. In case it happens due to gas then you may take a medicine for gas relief. • Stay relaxed and reduce stress and anxiety as these issues may also trigger stomach rumbling. • Engaging in physical activity can help cure this problem as it improves digestion and reduces stress. Bending exercises, in particular, are useful in this regard.Furthermore, it is believed that taking a deep breath when you feel that the gurgling is about to start is helpful in stopping the rumbling temporarily. Hold the breath for a few seconds, that is, until the rumbling stops.